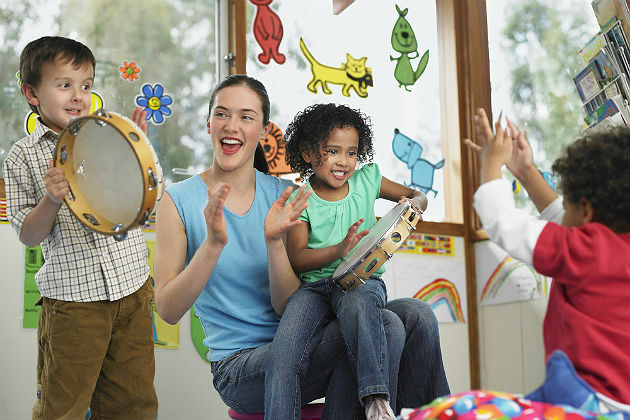 Most language teachers will agree that songs and chants help students master another language. In addition, language teachers will agree that using movement and hands-on learning experiences, such as in total physical response strategies, also help students acquire language. "Total physical response (TPR) is based on the theory that the memory is enhanced through association with physical movement,” says Tim Bowen in "Teaching approaches: total physical response." The teacher says something in the language, and the students respond with an action movement. Language learning can also be facilitated by communicative strategies. In communicative learning, students are given interactive means to communicate, producing language through use of tasks that are authentic and have meaning for students. These are just a few examples of student-centered language-acquisition approaches. Just like language teaching, music teaching includes approaches the utilize movement and communication. The two most common approaches to music instruction are the Kodaly and Orff methods. These approaches have similarities to language instructional approaches. Likewise, principles and strategies for music instructional approaches can be fused into language classrooms. What are Kodaly and Orff? Zoltan Kodaly created the Kodaly approach to music teaching, while Carl Orff created the Orff approach. Kodaly's approach focused on teaching folk songs that children can relate to because the songs were from children's own heritages. The Orff approach is built upon these ideals, but it also focuses on internalizing, feeling and expressing music through the body and movement. Both the Kodaly and Orff approaches emphasize sound before symbol, meaning that auditory sounds should be introduced and acquired orally and aurally before written symbols are. They both also emphasize learning through what is familiar to children and progressing into improvisation. Orff introduces learning music through exploration, listening and singing. Matching symbols to spoken sounds fosters rhythm development. Body movement proceeds with clapping, stomping, snapping and patting. In "Kodaly? Orff?," Dr. S. Scott says the Kodaly approach differentiates the processes of teaching and learning. "The teaching procedure is prepare — make conscious — reinforce — assess, whereas the students progress through hear/perform — infer/derive — hear/construct/notate — read — create," Scott writes. While Kodaly relies more on aural production, Orff utilizes movement. Orff lessons are often structured around a book or poem. The teacher reads the text, and students respond by dramatizing the book or poem through instrumentation and movement. In Orff lessons, students use principles that are fundamental for language acquisition. They include speech, chanting, singing, dramatic presentations and movement. The end result of lesson is an improvisation and performance. Kodaly lessons are centered in folk songs, hand gestures, images and syllables. Kodaly includes similar concepts as Orff, but Kodaly also includes structured learning of aural to oral kinesthetic learning, transitioning into written text and recognizing it. How can these concepts be fused into language teaching? The Kodaly and Orff approaches to teaching music incorporate approaches to language acquisition, such as TPR and communicative learning. It is beneficial for language teachers to understand principles of the Kodaly and Orff approaches and how to fuse them into lessons, because there are fundamental concepts from which students who are learning an additional language can benefit. "Lesson Planning the Kodaly Way" by Ruth Boshkoff provides an in-depth look of how lessons can be planned and presented with the Kodaly approach. "How I Teach the Orff-Schulwerk Approach" provides an overview of planning and teaching a lesson with the Orff approach. Creating: Students can create oral and written communications that infuse components of grammar and vocabulary. Creating can be abstract or more concrete, depending on instructional goals. Moving: Students can be asked to use movement to learn vocabulary, grammar and sentence structures. Concepts can be dramatized in similar approaches that Kodaly and Orff use. For example, "walking the beat" can be modified into "walking the grammar." Echo clapping can also be beneficial to development of spoken discourse. Singing and chanting: Students can be asked to sing folk songs in both native language and translated into English. Stories and poems can be sung or chanted while incorporating movement or dramatization to promote oral, aural and literacy development. Many Orff and Kodaly strategies of spoken and sung forms can be creatively fused into language classrooms. Playing: Students can be asked to play out language goals. Play can be combined with movement, singing, chanting, reading, writing and creating. Reading and writing: Students read text after being orally and aurally introduced to main concepts through sung or chanted forms, rhythm and dramatization. Reading text is compared to sung and spoken forms. Students learn to recognize these forms in stories, books and poems. Teachers then introduce writing tasks for students that include free expression and improvisation. Improvisation can be utilized in the language classroom by introducing written forms to students, giving various examples, and practicing them through collaborative learning. Teachers then give a writing starter for students without the ending. Students are given structural hints to use as a guide while then improvising endings for the writing starter. Listening: Listening development is standard in language classrooms. Kodaly and Orff approaches to listening such as listen, practice and produce are beneficial. Listening can also be combined with folk songs, chants and sung texts for development. Listening can include movement and dramatizing to help students feel the language. Performing: Students perform after all other components are practiced and developed. Performing is similar to independent practice. Connecting teaching and learning through the intrinsic internal development and curiosity in learning and production is the basis of Kodaly and Orff. Language learning can be enhanced through the fusion of these approaches to teaching music. Beth Crumpler is an ESL freelance curriculum writer, e-learning content developer and instructor. She has developed written content for some big names in the education sector. She is the founder of the adaptivelearnin.com website and blog, which both present ideas for using adaptive concepts in learning. She is a certified teacher of ESL and music. Beth enjoys studying technology for teaching ESL and in her spare time studies Spanish. Is Twitter still popular, relevant, or worth it for businesses?